This is the second post on fieldwork: this one is specifically about field notes – some thoughts on how to write them and how to transcribe them. I am still working this out, so it’s a thinking process in progress. For my PhD, I gathered data largely from sitting in on lecturers’ classes and watching them teach, scribbling furiously during each one hour lecture. As you can imagine, over 14 weeks in two courses this ends up being a rather thick pile of notes. In my case it amounted to 5 and a half notebooks full of notes (over 500 A5 pages). These all had to be transcribed and organised so as to make sense of of them, and so that I could put them into NVivo10 to analyse them as part of my larger data set. Also, they needed to be typed up so I could copy and paste relevant pieces into my chapters as needed. I procrastinated a lot about doing the transcription. It’s not my favourite activity as a researcher. But I couldn’t have someone else do it because these notes were something I really needed to read several times, understand and sift through. I think, in hindsight and in agreement with Pat Thomson, that tedious as it is all researchers should try and do as much of their own transcription as possible because of how involved it enables you to become with your data. It makes the analysis process more enjoyable and productive too. I thought what I would do in this post is list some of the things I did, why and what I learnt along the way in the hopes that you may find it useful if you, too, are gathering some of your data this way. 1. I handwrote my notes for two reasons: the first is that in the one class students were not allowed to use laptops because the lecturers wanted them paying attention as part of their training for the profession they will eventually enter, and the second is because I write faster than I type and writing is quieter. I tend to bash my keyboard a bit, and I did not want to distract other students or stand out too much by using equipment they were not allowed to use. A further plus with handwriting that I learned along the way was that I could easily copy diagrams lecturers put up on slides or drew on the boards, and I could represent what they were saying pictorially or non-linearly as well, which was often quicker and easier and made my notes feel more authentic to me. 2. Pat Thomson wrote in a blog post a while back that she takes lots of field notes, and that she tries to capture verbatim what is going on as much as she can. I tried to do that too, and often was able to succeed in bits in one of the two courses because both lecturers talked fairly slowly and deliberately and paused for students to ask questions or take notes, so I could keep up. This was harder in the other course where the lecturers spoke quite fast. I am having this issue now, too, in my post-doc research where one lecturer in particular is a very fast talker. However, I am much more comfortable with my theoretical framework now, so I can note particular kinds of phrases or instructions or comments that he says because I know I will use them in my analysis later on. However, I want to avoid being too selective in my hearing, because I don’t want to pre-empt the data or tell it what to tell me. I want to be surprised by it too, and find things I am not necessarily anticipating. Thus, I try now as I did last year to write as much as I can of what is going on in the moment, and can then sift the notes later and reorganise them during transcription. 3. I developed a shorthand: lecturers’ initials for the lecturers involved, like CA or BM (not their real initials). I also used S for student and tried to keep track of students’ questions or inputs where I could hear them clearly (the classes were large and often noisy). So I would have S1, S2 and so on engaging the lecturer in conversation or debate. 4. I didn’t transcribe everything. By being such a procrastinator about the transcription of the field notes, I ended up transcribing them while I was also beginning to analyse the data, so in a way this worked out well because it meant I had a sense of what I needed and what was just additional information that was unimportant, like comments made about admin issues, or comments I wrote about the lecturer telling the students off for not coming to tutorials the week before. Thus, I did not need to transcribe every word I wrote in my notes, and what I did was to read through my notes first, quickly, to remind myself of what I had written, and noted things I could excise. 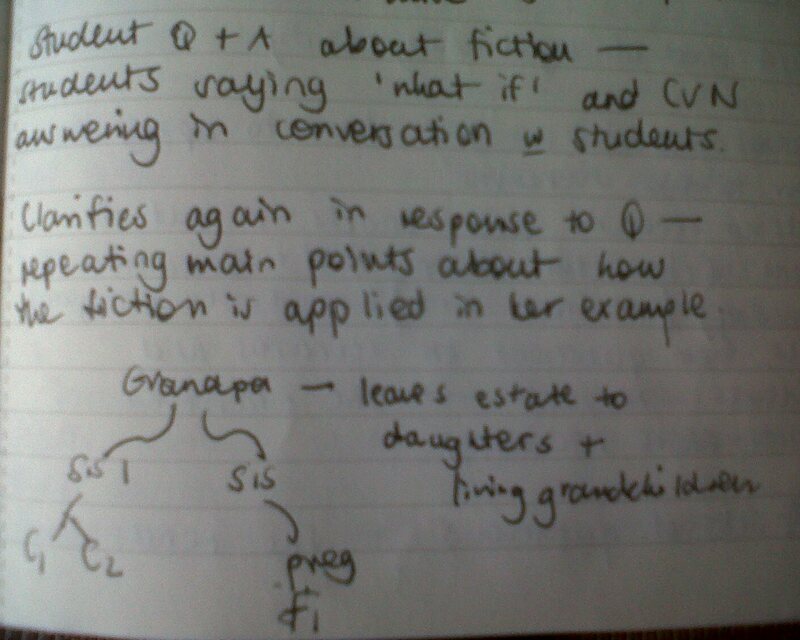 I learnt that it is okay to cut bits of your notes out and just not transcribe them. You won’t analyse ALL your data. 5. I had to do some reorganising when I transcribed my notes. Field notes are very in the moment – you are just trying to keep up and get it all down as faithfully and fully as possible, and you don’t really have time to think. When you go back to transcribe, though, you do have time and you can see how you can transcribe your sometimes chaotic and messy notes to impose a little more order, often needed in data analysis, and also how you can represent your pictures and scribbles in words so that you know what you mean, and can show readers what you mean if you use those examples in your chapters. I think that you need to be careful with reorganising, though, because you don’t want to rewrite history and make things that were chaotic seem simple, or things that were challenging seem easy. You would be skewing or tampering too much with your data and this would be unethical. It may also rob you of some potentially interesting findings. However, a little reorganisation that makes the notes easier to read and easier to represent to a reader, while staying true to the original scribbles, may sometimes be necessary. I think the biggest thing I learned, and am still learning, is that it is an ongoing process of learning how to write these notes well, and how to collect rich and interesting data in ways that will be usable and make sense to me later. Stop every few notes and look back – reflect on what is working and what is not, and try to use that reflection to improve your taking of field notes. Capturing them can be tedious but field notes can also give you many-faceted and rich data for later probing and analysis. I have been thinking about fieldwork a lot lately, and how to improve on what I did with it during my PhD because I am doing it all again, post-doctorally. I have started a new, connected research project which I will probably write about later on, and I am wondering if the way I am doing my fieldwork is the best way. I am not really doing anything too different yet, and I’m working in the same two departments although with different lecturers. This will probably be one of three posts thinking through different aspects of doing fieldwork, so I’d like to start with considering the question of ethics, and the ethical behaviour of researchers in ‘the field’. Fieldwork is generally defined as ‘an investigation or search for material, data, etc, made in the field as opposed to the classroom, laboratory, or official headquarters’ (http://www.thefreedictionary.com/field+work). I gather data in classrooms, and in conversations with lecturers, and from documents. This year I am also adding student voices to the mix. This may not fit this definition but for the sake of using one word instead of two, and because it tends to be a ‘catch-all’ term for this phase of a research project, I am going to use the term fieldwork to talk about the phase of gathering different kinds of data from different sources, even is a classroom or lecture hall. The lecturers I worked with last year and the ones I am working with this year are colleagues. I know them and they know me, and we respect and like one another professionally and personally as well. So it is very important that we can work together well, and that I am ethical in the way I behave as a researcher because that will affect the way I am received as a colleague. There are several benefits to working like this: access to data is much less complicated – I have been welcomed with open minds and arms, and they are interested in what I am doing; I can ask questions after class and even in class if I want to, so I feel like part of the environment rather than a detached outsider (more about this in another post perhaps); I am really enjoying this work a great deal because these departments are so interested and welcoming. However, there are also drawbacks. The biggest, for me, stemmed quite specifically from the kind of data gathering I was (and am still) doing – what Paul Trowler calls doing research in your own ‘backyard’ and learning what Kevin Williams has called ‘guilty knowledge’. I work at the same university I gather my data in, and I do other kinds of work from time to time with the lecturers who are talking to me and letting me into their classrooms. So, I am not a detached outsider. I am part of this environment, and it is thus a challenge to try to be more objective about what I am seeing and thinking, and not get too emotionally involved with the courses or the lecturers and students and therefore end up skewing the representations of my data, or omitting important observations because they may not paint the lecturers or students in a good light. Williams especially talks about this in his paper – he argues that doing research with colleagues in your own university, in a place in which you have invested part of yourself, is difficult because sometimes you learn things you are not sure you should disclose, or dig into deeper. This can leave you and your research in a tricky place, as your professional identity as a staff member can conflict with your identity as a researcher. Choices may have to be made, and this is where custom can clash with character. Essentially, the literature on research ethics talks about ‘custom’ as being chiefly about the forms you fill in and the ethical protocols you agree to abide by. These are the standard ethical rules to live by in your field. ‘Character’, on the other hand, is to do with how you behave as a researcher when confronted with guilty or difficult knowledge or situations that present you with ethical dilemmas. This is an important distinction. I filled in forms, and got ethical clearance and promised, quite truthfully, to abide by the ethical rules laid down by my university. But when I got into the field, I was confronted by a couple of dilemmas that those forms and rules did not necessarily help me to solve. I had to call more in my character as a researcher, reflect very carefully on the dilemma, and speak to my participants openly about the problem yet without compromising myself or my research in that process. I had to rely on character, rather than on custom, to get me through and to keep the integrity of my research project intact. This was not easy, but through this part of my fieldwork phase, I realised that while the rules and protocols are there for a reason and need to be observed diligently, there are also things they cannot account for. It is when these unexpected twists and turns arise that you need to call on your own character as a person and as a researcher. You need to cultivate relationships, as far as you can, with your participants that are open, so that when difficulties arise that include or affect them you can share these and reach an understanding, solution or compromise as needed. Share with them, if it’s helpful, pieces of what you are writing and get their feedback. Show them your classroom or interview transcripts, and ask for their input and whether they would like anything omitted. Discuss their requests for omissions or changes with them openly, especially if they may compromise your research. Talk about this in your methodology, so your reader knows what happened too. It’s important to actually be ethical, and not just to say you will be, and it’s important to realise that things don’t always go according to plan in the field, so having an ethical and upfront character and approach to your research will stand you in good stead in case the unexpected is part of your journey too. As promised, a post on something a little less personal and a little more ‘academic’. The topic for this week’s post is theoretical frameworks, and why it’s a very good idea to have one fairly clearly in place before you start collecting and analysing your data. Right. When I started my PhD in 2010, I spent the whole of that year reading about academic literacies and writing centres, thinking that I wanted to do my PhD on a topic related to the role writing centres play in developing students’ academic literacies in the disciplines. I just couldn’t get into it, though. I had a whole lot of substantive theory, but nothing that looked or felt like a framework for a study that would guide my data gathering or my analysis. After a long and helpful meeting with my supervisor at the end of that year, I found my way to Basil Bernstein’s work and from there to Pierre Bourdieu’s and to Legitimation Code Theory. I had, much to my joy, found my framework. I had the beginnings of a ‘gaze’ to use Bernstein’s term, or a set of specific lenses with which to scratch at my ‘conceptual itch’ to use Lis Lange’s term (well, it was her I first heard it from) – the thing that I really needed to find out or the question I really wanted an answer to. I could now rethink my topic, and begin to form this gaze so that I would know what data I needed to collect and what I should do with it to get at the answers and scratch the itch. So, I spent a lot of time in 2011 and 2012 writing and rewriting what I suppose some might call a literature review, but which my supervisor and I called a conceptual or theoretical framework. I had to lay very firm foundations for this study because the theory I was reading and the concepts I used were so new to me, and I really was starting from scratch in many ways in this field. I often felt frustrated at how much time I was spending on this one chapter out of six that had to be written, and I felt lost a great deal of the time in the mess of reading and thinking and connecting of dots. It was a hard couple of years, but in that time I got my proposal through and wrote a pretty good draft of chapter two. I found myself, at the end of 2012, very nervous about leaving Theoryland, as I thought of it, up on its pretty, fluffy clouds. I felt safe there, because I had pretty much worked out what Bernstein called the ‘internal language of description’ for my study. In other words, I could tell you how the different parts of the theory and concepts I chose to use cohered, and why they fitted together like that and what sense to make of them in the context of my study. But that was all I could do at this point. So I had to move on. I was encouraged (read shoved) off my clouds and into the mires and muck of field work and data gathering. And this is where things started to get really exciting for me (and then boring later and then exciting again). I observed lecturers teaching and read their course documents, as well as conducted in-depth interviews. In the first week of lectures, I found I could see and hear the theory – that internal language – being spoken in the teaching and coming to life in front of me. It was so exciting and also so affirming. This was the right data to be gathering and my study was moving in the right direction, given my focus and my questions. I do not think that this would have happened quite so clearly had I tried to shortcut the first stage of laying those foundations and working out, as carefully and fully as I could, that internal language of description. I needed to have my gaze in place, as nebulous and fuzzy as it felt, before I gathered by data and started to think about what to do with it in analysis. I won’t be glib and say that the data gathering was easy – it was often really tedious and the semester felt so long; recording detailed fieldnotes in 8 lectures per week of an hour long each for the better part of 14 weeks was tough going for me. But at no point did I really doubt that I was gathering the right data for my study, and even when things got very fuzzy and I couldn’t hear the theory so clearly or see my way, I could count on the fact that my gaze was there and that it would deepen and develop as I really started to get into my data more systematically. It was very reassuring on the whole, and while it didn’t make the field work stage a breeze, it did take some of the anxiety and doubt away, and kept me moving towards the next step. I would, based on my experience, argue that even if you feel frustrated and feel like you are taking way too long working out your own internal language of description, it is worth doing as well as you can. The firmer the foundation going forward, the less the likelihood (I think) of having to rush back and get different or more data because you don’t have enough or the right kinds of data. It reduces the stress and anxiety that inevitably come with gathering data and starting to think about analysing it, because having your gaze in place can assure you that you are moving in the right kind of direction. However, a word of caution: it can be really lovely and safe and warm up in Theoryland, but staying there will never get your PhD finished. You will need to find the bridge down to the Data Swamps so that you can move between the two as you scratch your own itch and answer the questions that drive you onwards.